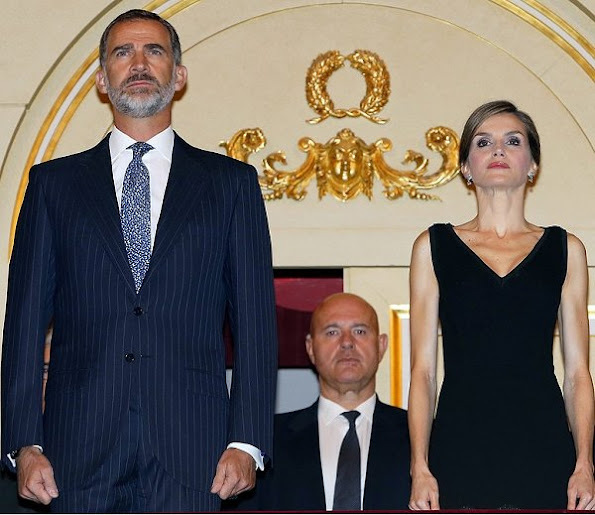 King Felipe VI and Queen Letizia of Spain attended the Royal Theatre (Teatro Real) new season inauguration on September 15, 2016 in Madrid, Spain. Guiseppe Verdi's opera 'Otello' opened the season, with setting by David Alden, direction by Renato Palumno and Gregory Kunde and Ermonela Jaho in the main roles. Stunning! Such a gorgeous couple! Lovely way to spend her birthday 😊 love the cut out on the back and the bottom of the dress is beautiful! Why does she always like, or feel the need, to show too much skin? It's so vulgar and inappropriate! I really like Letizia's hair and her makeup looks also very beautiful. However, that dress of hers...no sleeves, lower part of the dress looks like petticoat (on the last pic its looks like she's posing in her petticoat or nightie). The back of the dress looks lovely though. The Joker face we see in the first picture is a result of too much plastic surgery and fillers. She dresses too young for her age, too much skin is not appropriate for a 44 years old queen and a mother of 2. She dresses like the Kardashians, it seems they are her role model. @ anonymous, If you think Queen Letizia style is the same as Kardashians you need badly to make appointment with ophthalmologist. The dress would look more elegant if it was a little bit longer. Bellísima, estilosa, chic y única Letizia. La pobre Anónima envidiosa (sólo es una que repite y repite sus insultos) que se muera de rabia. I wouldn't go so far to say that she dresses as trashy as the Kardashian's but she definitely isn't appropriately dressed as a Queen. I get that she wants to show off her figure but that dress is completely wrong and way too short for someone her age. Beautiful! Perhaps a little short, but if you have got it, why not flaunt it. Gorgeous dress for a woman half her age. Not very appropriate for a queen, but heck it's a Varela so she had to wear it. Angie don't bother to reply, I know that according to you she can't do no wrong, but this is my opinion. Pues voy a contestarte, mujer. Si para mí va casi siempre muy bien vestida, está claro que para ti va siempre mal, pero por cuestiones ajenas a la ropa. Cada uno con su cadaunada. The QUEEN look STUNNING. The Queen and ladies as slim as she can wear a dress like that. 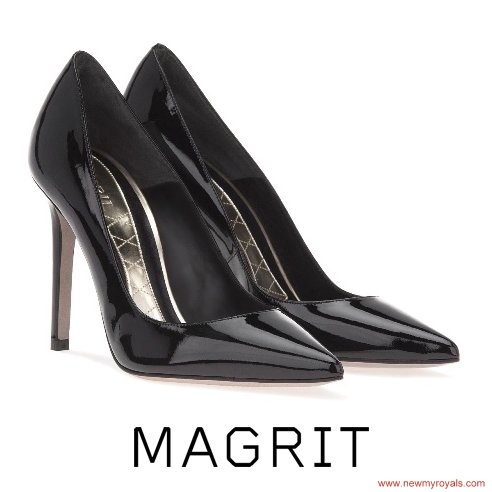 The Queen has the figure and style for this little black number. WELL DONE QUEEN AND KING OF SPAIN!!!! Embarrassing for a queen - she already has everything a woman would want, so why stoop to this? It's not necessary to try to look tempting at her age or station in life. Far too short. back cut is nice. Eugenia Silva iba muy guapa, pero con unos floripondios más propios de un picnic o de un bodorrio que de la Ópera. Mucho mejor el LBD de la Reina, que sube las escaleras con mucha gracia y estilo, por cierto. Tienes razón Angie, el vestido de Eugenia me hizo pensar enseguida en una invitada al bodorrio de un torero.